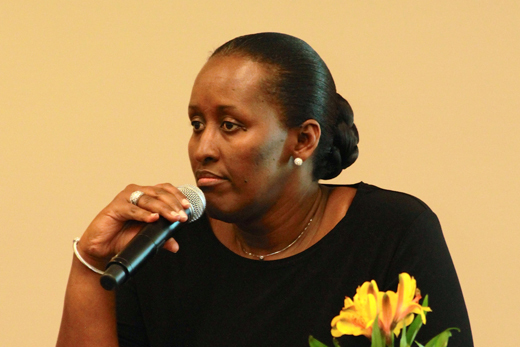 In a visit to Emory's Rollins School of Public Health, Jeanette Kagame, first lady of Rwanda, addressed the "courage and commitment" of her country's citizens. "Imagine starting to rebuild a society that has hit rock bottom." This was the monumental challenge, as posed by Jeanette Kagame, first lady of Rwanda, in a discussion of the progress her country has made in the last two decades. Kagame spoke at Emory's Rollins School of Public Health (RSPH) on Sept. 19 in a visit organized by Susan Allen, an Emory HIV/AIDS researcher who has worked in Rwanda since 1986. The visit was co-hosted by RSPH and the Halle Institute speaker series, with introductions by Jim Curran, dean of RSPH, and Philip Wainwright, vice provost for international affairs and director of the Halle Institute. "We are often reminded that dignity is a right for all Rwandans, just like it is for every other person in the world," Kagame said. "With great sacrifice, hard work, a real longing for change, and a transformational leadership we managed to reclaim our dignity." Kagame did not go into detail about the 1994 genocide, but she did outline its legacy: hundreds of thousands of orphans. Since then, Rwanda's government has had to rebuild its infrastructure, education system and justice system, while pursuing a policy of national reconciliation, she said. Now one of Rwanda's priorities is to expand its economy and create jobs. The government aims to reduce its dependency on foreign aid and has made considerable progress, reducing foreign aid from 85 percent of the budget after the genocide to 40 percent now. In her speech, Kagame highlighted Rwanda's expansion of its elementary and secondary education systems in the last two decades, and a public health practice called "maternal death audits," aimed at reducing the rate of mortality in childbirth. She said the proportion of women in Rwanda's parliament was 60 percent, the highest in the world. Kagame's visit was part of the sixth celebration of Rwanda Day, a gathering of the Rwandan diaspora organized this year in Atlanta. Her husband Paul Kagame, president of Rwanda since 2000, visited Mercer University the same day. Kagame was one of the founders of the Organization of African First Ladies against HIV/AIDS and has served as its president, and has advised the World Health Organization and other international organizations on child health and HIV/AIDS research. Allen, a professor in Emory's Department of Pathology and Laboratory Medicine and director of the Rwanda Zambia HIV Research Group, recalled that support from Kagame was critical for her Project San Francisco to set up a couples' HIV testing program in Kigali, a pilot project for establishing couples' testing across the country. Rwanda is the only country in Africa to test all pregnant women for HIV with their partners, which has contributed to keeping prevalence of HIV infection at the low level of 3 percent for the last decade, Allen said. Kagame's talk was designed to be "A Conversation on the Courage and Commitment of Rwandans." A discussion panel included the First Lady; Yamina Karitanyi, head of tourism and conservation at the Rwanda Development Board and former ambassador to Kenya; political scientist Anastase Shyaka, CEO of the Rwanda Governance Board and an expert on conflict resolution; and pathologist Eric Hunter, co-director of Emory's Center for AIDS Research. Panelists heard from a returned Peace Corps volunteer who addressed the First Lady in Kinyarwanda about his experiences, and panelists discussed the challenges of teaching conflict resolution to genocide survivors and orphans, and educating Rwandans about their shared history, without creating heroes and villains. In addition to Kagame's talk, a Friday lunchtime symposium on how Rwandan and international courts have dealt with genocide perpetrators was held at Emory Law School.